With a pellet grill at home, you will have the perfect companion to enjoy the summer. It will allow you to prepare grilled and smoked treats for your friends to devour. Depending on the model that will be chosen, it can also be used for other purposes, such as roasting and baking. As you start looking at the products available, you will be overwhelmed with the choices available. 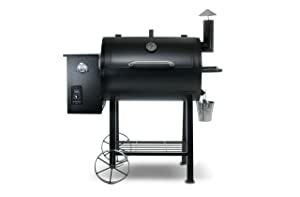 To help you pick the right one, read the rest of this Pit Boss Pellet Grill review. We will start with a discussion of some of the general notable features within their product line, followed by a more detailed discussion of three of their models. 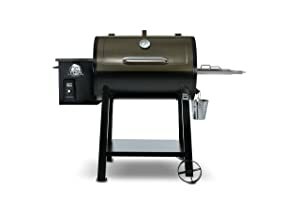 With Pit Boss, you will enjoy a diverse selection of grills that range from economical to high-end, from small to large. Whether you are a novice or an expert griller, there is sure to be one that will be perfect for your needs. One thing is for sure – regardless of which model you choose, it will make grilling an experience that you will often look forward to! Notable Features of Pit Boss Pellet Grills: What makes a Pit Boss grill exceptional? This section will let you know. We will discuss some of the notable features that you can find in most of their products. Take note that the features below are applicable only to wood pellet grills and not to their other types of grills or smokers. Digital Control Center: This is one of the common features that you can find in the grills produced by the company. It is the one that ignites the grill and controls the temperature. The range will differ based on the model that you will choose. More often than not, however, the minimum temperature is 180 degrees Fahrenheit and the maximum is 600 degrees. There is also a fan-forced convection that ensures consistency of the heat produced by the grill. Versatile Functions: With Pit Boss grills, you can enjoy the best bang for the buck. This is basically because of the fact that they can deliver multiple functions in one product. Aside from grilling, they can also be used for smoking, barbecuing, roasting, searing, baking, and braising, among other things. This makes the perfect companion for anyone who wants to be a gourmet chef even at home! There are also other models that come with a flame broiler. The latter is an add-on that will be useful for steaks and burgers. It comes in the form of a slide-plate, making your grill more versatile. It will also provide you with complete control in direct flame grilling. Grilling Made Portable: If you take a look at the wood pellet grills that are manufactured by Pit Boss, there is one common denominator – they have wheels. Most of the models only have two wheels on one side, while there are also models with wheels on the four corners. This makes sure that you can easily move the grill around, depending on where it is to be used. Has the Space that you Need: Whether you have a small patio or an expansive garden, whether you need a grill that can be used at home or to be brought along with you during your camping trips, the company has got you covered. Their wood pellet grills are available in a range of sizes to suit varying needs. Aside from the main cooking area, there are other models that come with an upper rack for more space when grilling. Some are also equipped with a warming rack or a side tray. There is also a bottom tray that can keep everything that you will need when grilling. In the case of larger and more expensive models, they even have a full cabinet enclosure. User-Friendly Features: The grills from Pit Boss are also known for being user-friendly. Even if you are new to grilling, their products will be effortless to use, even when it comes to cleaning and maintenance. There is also no need for guesswork as the grill takes care of most of the job. Their wood pellet grills are equipped with a temperature gauge on the cover of the unit. This will make it easy to monitor the progress of cooking and to make sure that the level of heat is just right. There is no need to lift the cover, and hence, flavor and aroma will be trapped inside. In the case of most of their wood pellet grills, there is a knob on the side. All that you have to do is to turn the dial to select the desired temperature. The temperature range may vary from one model to another. Premium Construction: At first look, you might be surprised that the prices are quite steep. For some people, this will provide them with an immediate reason to ditch the product. However, I suggest that you take the time to understand its features, and by then, you will understand why their products are quite costly. Their grills are made with the use of premium materials that are able to withstand the test of time. Their cooking grills are porcelain-coated. They also use high-quality steel in the body of the grills to make them resist wear and tear. They are also powder-coated to be protected from external elements that can speed up damage. They are built to last, unlike in the case of other grills that will ask for a replacement within a short span of time. Uses 100% Natural Wood Pellets: The company manufactures their own pellets that are compatible with their range of grills. These pellets came from American hardwood forests. They also take pride in the fact that they are 100% natural with no adders and fillers. With this, you can be sure that it will enhance the flavor and aroma of whatever it is that you are cooking. You will be spoiled for choices in terms of the pellets that you can purchase from the company. Some of the top choices include apple, hickory, cherry, and mesquite. In this section, we will give you a glimpse of what to expect from three of the models from Pit Boss, which will make you understand why they are favored even by people with discerning preferences. With this pellet grill, you will be able to enjoy a cooking surface of 820 square inches, which is already quite big compared to the other options you can find within the competitive landscape. This means that you will be able to easily cook large batches for a big group. It also comes with a dynamic temperature range, making it easy to customize the level of heat depending on what is it that you are cooking. The temperature can be adjusted from 180 to 500 degrees Fahrenheit. Nonetheless, there are other models from the company with a higher range, which can reach a temperature of up to 600 degrees Fahrenheit. Similar to the other models from the company, it also comes with an electric start feature, which will make your life easier. There is no need to manually light the fire. All it takes is a single push of a button to get started in grilling. This is one of the reasons why it is ranked as impressive when it comes to being user-friendly. There is a LED screen on the grill box, which will allow you to easily monitor the progress of cooking. This will show the exact temperature and will let you know if you have to make adjustments for the perfect outcome. Aside from the LED read-out, it also comes with a digital control board. Lastly, it has 16-gauge steel construction, which is reflective of the durability of the product. As what the company is known for, this material is the reason why it can withstand many years of use. As it is named, this product comes with several deluxe features that you will love, such as two-tone black and copper finish, which gives it an aesthetically-pleasing design. There is also a side shelf to provide you with additional space, which also doubles as a serving tray. There is even a bottle opener incorporated into the body of the grill. The main material used in the construction of the grill is porcelain coated steel. It is long-lasting, making sure that you will enjoy the best value for your money. With its structural strength, you can be confident that it will take a long time before the grill asks for a replacement. More so, this model has a total cooking surface of 440 square inches. The primary cooking grid is 340 square inches. There is a removable upper cooking rack, which has an area of 100 square inches. Similar to the three products that are mentioned in this post, the temperature range is from 180 to 500 degrees Fahrenheit, which can be conveniently adjusted based on what is required by a specific recipe. It also comes with fan-forced convection, which allows it to deliver precise cooking functions. More so, it makes sure of the consistent and even distribution of heat on whatever it is that you cook. This also comes with a digital control burn system, which is another thing that makes it easy to use and does not require guesswork. This increases the likelihood of not over-cooking or under-cooking your food. With this grill, you will be able to enjoy up to 700 square inches of cooking space. This is slightly smaller than the model mentioned above, but such should not be much of an issue as it is still big. The upper rack is 507 square inches while the lower rack is 193 square inches. Based on the details from the manufacturer, this space is good enough when you are grilling for up to six people. Meanwhile, when it comes to the temperature range of this grill, the maximum is 500 degrees Fahrenheit, which is the same with the other models above. If you prefer a higher temperature range, there are models that can reach up to 600 degrees Fahrenheit. One of the unique features of this model is the flame broiler. This is a slide plate that will provide you with a complete control of the grilling. This will help you achieve perfection in your steaks and burgers, allowing you to do it like a gourmet chef. In terms of power and performance, on the other hand, it has 40,000 BTU. There is also a built-in thermometer that will make it easy to monitor the progress of cooking. The electronic ignition, meanwhile, is one of the reasons why it is user-friendly. If you are looking for portability, this can also be a great choice. It is equipped with two wheels that will make it easy to move it around. Lastly, the hopper has a capacity of 20 pounds. This means that it will take quite a while before you need to refill it with wood pellets. 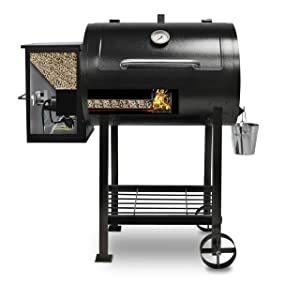 After reading this Pit Boss Pellet Grill review, it should be easier by now for you to decide what product to choose. The manufacturer has been one of the most trusted names in the industry. They have a wide range of product to suit your needs. Regardless of your budget, there is a grill that you are sure to love! Have you used a Pit Boss Pellet Grill before? Is there anything that you would like to add? Do not hesitate to leave a comment below.